The salinity tolerance of grey mullet, Mugil cephalus (L) fry was investigated in replicate tanks of different salinity regimes of fresh water (0‰), 5‰, 10‰, 15‰, 20‰, 25‰ and sea water (30‰) in the laboratory for eight weeks. 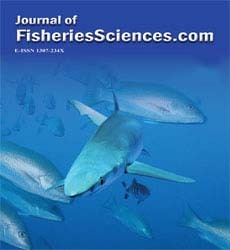 The salinity tolerance experiments showed that the fish tolerated a salinity range of 5‰ to 25‰. The highest survival of 40% was recorded at salinities 10‰ and 15‰. Statistical analysis of the mortality in all the salinity regimes with ANOVA showed no significant (p>0.05) variation. The highest % gain in length and weight were 22.02 and 22.09 respectively in the 15‰ and 20‰ salinity regimes. The least FCR value of 2.11 and the best FCE value of 47.39 were recorded in the 25‰ regime. The best SGR value of 0.019 was recorded in both the 15‰ and 20‰ regimes. The fish has a good potential for brackish water aquaculture; its fishery and culture in the brackish environment can be sustained.